Her bluntness caught me off guard. I’m a volunteer, and I wasn’t exactly sure how the staff would want me to answer. “Unfortunately, we get so overcrowded sometimes that we do euthanize animals,” I said. 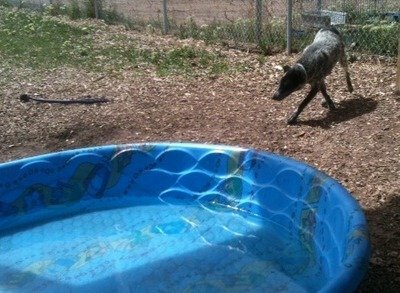 Heeler Lucy approaches the baby pool with caution. The woman gave me a disgusted look. “I live in Albuquerque,” she told me. 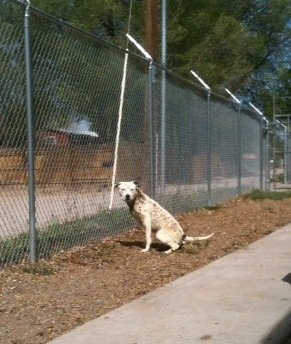 “I don’t understand why you don’t send the dogs there.” Albuquerque is about 90 miles south of the Espanola Valley Humane Society (EVHS) in northern New Mexico. The woman from Albuquerque is right. There is a no-kill shelter there, but it’s also “limited admissions.” Which means once they’re full, they don’t have to accept any more animals. 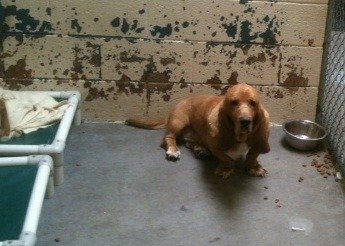 The area’s open-admissions shelters — that is, facilities that accept any animal who arrives at their door — all face serious overcrowding issues. To be truly No Kill, the movement asserts, a shelter must be “open admissions,” not limited admissions. In other words, they must not only refrain from euthanizing animals for space reasons, they must also accept every dog, cat, rabbit, ferret, etc., delivered to them. To become No Kill is a noble aspiration. It is also an incredibly difficult status to achieve while ensuring a decent quality of life for each animal once they leave the facility. 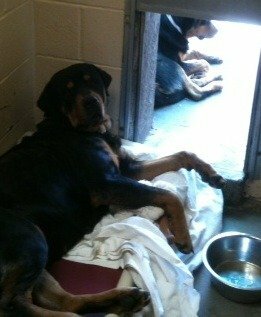 In Espanola, the city where I volunteer, 1 in 2.3 households last year surrendered an animal to our shelter. That’s 43 percent of all homes in the community. Another sobering statistic: At the region’s annual Fetchapalooza Adoption Fair last month, EVHS successfully placed 83 animals. The following Monday, we took in 38. The dogs and cats, puppies, and kittens, just keep on coming. My guess is that those who say No Kill is possible in every state in the U.S. would have suggestions, and criticism, for EVHS. There’s probably no shelter in America that couldn’t be improved in some way. But I do know that EVHS does a lot right. They take full advantage of social media to promote their animals. They hold frequent off-site adoption events. They sponsor an aggressive, extremely low-cost spay/neuter program (this is an area not flooded with wealth and resources). They work closely with local rescues and maintain an active foster network. I don’t know everything that happens behind the scenes at EVHS — and I don’t agree with every decision that gets made there. There are euthanasias I would have fought against — not because I thought adopting out the particular animal would have been an easy task — more like I felt a miracle could be achieved and the right situation could be found. Or that maybe after relentless hinting, Mike would give in and say, “Ok, bring that mangy 12-year-old home.” Even though I know adding an animal to the family would not be in the best interest of my current dogs, my marriage, my financial situation, and on and on. So I wish I had an answer I felt good about when asked if I “kill dogs.” Maybe I could just say, “We don’t keep dogs languishing in small, lonely kennels month after month, hoping that the numbers will improve and families flush with love and time and money will flock to us.” But that’s not a great answer, so I don’t give it. 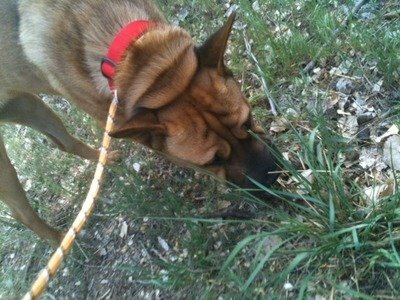 At a house on the very same road as EVHS, a dog is bound to a doghouse via a long chain. I see him every single time I visit the shelter — twice a week. I have never driven by the house and not noticed the dog there. And never have I seen anyone interact with him — ever. This dog has a home. This dog has shelter and he has water. He’s not dead. But I wouldn’t call it living.